To Sit or not to sit… To Stand or not to stand… That is the question. It has been a normal daily routine going back to before typewriters and through the computer age for one to sit at a desk to work or to relax and read email or surf the web. In the past few years, the logic of sitting down at a desk has come into review as to the impact upon the user’s body and what happens if one sits down all the time. University studies had shown that extended sitting was having a negative impact upon the human body with a possible increase in coronary heart disease and other health problems from a lack of movement. Yet there was also the possibility of negative impact from extended standing. Be that as it may, as the jury is still out, I became interested in the standing desk as my work entails my use of a computer at a minimum four hours a day, Monday through Friday. I would take frequent breaks, maybe once or twice in an hour, leaving the room, walking outside and maybe down the block and back as I would feel tightness in my lower back. I have a friend who also sits at her desk as she is an author, writing novels, who asked me about standing desks. She was also experiencing issues and was looking for a change. 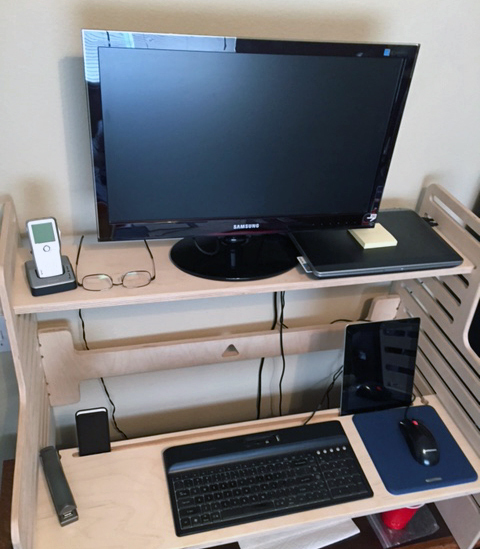 She wound up purchasing a standing desk and according to her, the more she uses it, the more she loves it, has not looked back and is enjoying the experience. I began to search further into standing desks and was amazed at the price variations from a couple of hundred dollars to a few thousand and the variety of desks that are available, to include motorized desks that raise and lower at the touch of a button. Options also included making my own do-it-yourself desk but I just did not want to go down that route with everything that was going on in my life so I focused on company produced desks. 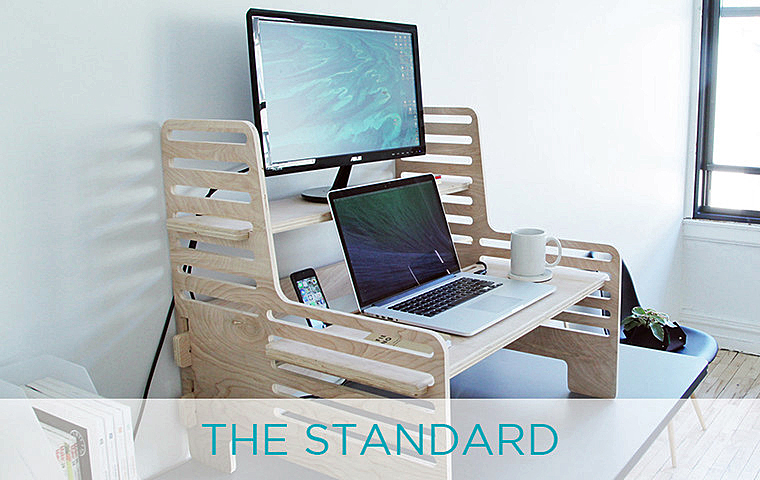 When I found UpStanding Desks website, their product immediately appealed to me; first for the simplicity of their design and the material utilized, second for the cost of the product. 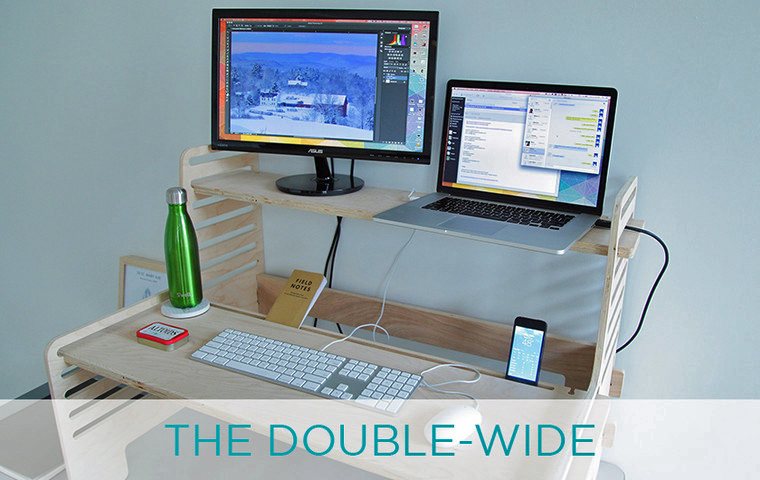 Started as a KickStarter project, UpStanding Desk has two models, the Standard and the Double-Wide. The Standard is designed for users 5 feet 1 inch to 6 feet 1 inch, with a width of 29 inches, a depth of 25 inches and a height of 27 inches. The Standard Tall model is designed for users 6 feet to 6 feet 8 inches and has a width of 29 inches, a depth of 25 inches and a height of 33 inches. The Double-Wide is designed for users 5 feet 1 inch to 6 feet 1 inch, with a width of 38 inches, a depth of 25 inches and a height of 27 inches. The Double-Wide Tall model is designed for users 6 feet to 6 feet 8 inches and has a width of 38 inches, a depth of 25 inches and a height of 33 inches. The desks were designed to be placed on the top of an existing desk or table, so the units are not that heavy or awkward. Each desk is cut from furniture grade Baltic Birch plywood that is hand sanded to a soft finish. The desk itself is composed of five pieces that lock together, no fasteners involved and honestly can be put together or taken down in a couple of minutes. There are two levels to the unit; one for your keyboard or laptop, the second upper level for your monitor or flat panel. The design of the unit reflects what people have found to be the most efficient way to utilize and plan a stand up desk. Most ergonomic recommendations are that the monitor should be 20 to 28 inches away from the user’s eyes with the monitor set at a 20-degree tilt with the user looking slightly down towards the screen. The user’s elbows should be at a 90-degree angle to the keyboard that will sit on front horizontal piece with the elbows close to the body. 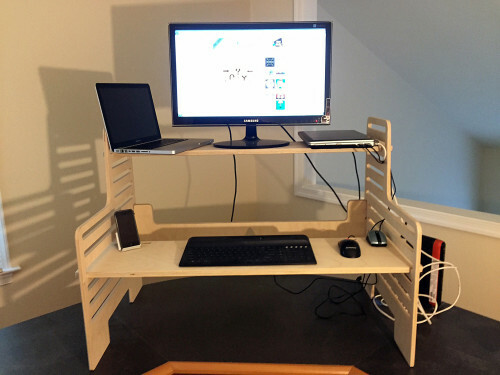 The user’s legs, torso, neck and head should be approximately in line and vertical.The nice thing about the design of the UpStanding Desk is that it is totally adjustable to the user’s needs. The slots on the upper and lower sections of the unit enable the user to adjust the height location of the monitor and the same for the keyboard or laptop. With the desk being above your desk or table, the space underneath the unit allows you to place your backup hard drives, USB hubs or whatever else under the unit without impacting your use of your computer and work space. The unit I have been using for the past two months is the Double-Wide. I have set it up for use with my Mac Mini and flat panel LCD, my MacBook Pro and 24-inch monitor and my work laptop and 24-inch monitor, all using a separate keyboard for my typing. I have utilized the laptops with the lid closed, allowing me to place additional items on the desk without any major impact on desk space. 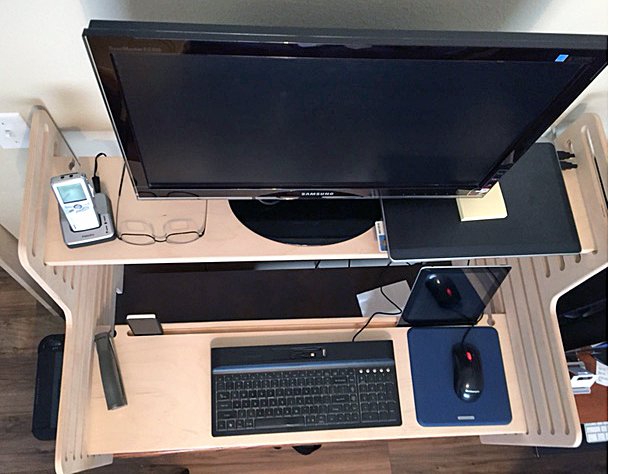 One of the really well thought out aspects of the UpStanding Desks is that the developers took the time to consider what users may need and included cord control slots, a smart phone/tablet slot that runs the length of the keyboard/laptop panel so that these items can be placed anywhere along the wood. The slot is cut at an angle that allows the user to see the screen as needed when someone calls or texts. After trying out the unit in all three configurations, I finally decided that this would be my “work” desk as I normally spend the majority of my time doing my job. The nice thing is that I can quickly replace my work laptop with my MacBook Pro and continue to work with basically no muss or fuss. Inside the box that the unit ships in you will also find an ergonomics guide and a packet of adhesive feet to place on the bottom of the unit to prevent it from sliding but I’ve not had that problem with the unit. Impressions of the unit: very good quality material, the unit is sanded smooth and satiny, the adjustability of the shelves is great, the shelves can be adjusted in one inch increments, the slots are a great help with placing my work iPhone and my own iPhone in the slots so I can monitor them, even if I have them on vibrate. I have also utilized the slot for my iPad. The slots for cords are good, of course it takes some getting used to coming from a “normal” desk. The ease of set up and take down is also really good; disassembled the unit lays flat and if you’ve saved the box it shipped in, just put it back in and go. In the time that I have been utilizing the UpStanding Desk, the tightness that had been gnawing at me in my lower back when I was sitting to work is no longer there. I can simply shift my position slightly and just taking a few steps within the room or down the hall to grab something keeps me going. Sam, one of the founders of the company, recommended the purchase of an anti-fatigue mat to assist in the transition over to the standing desk but so far, all is good and I’ve not purchased one. When I’ve shown the desk to people, they are normally impressed but do have questions regarding standing up to work. I have also had a couple of people ask if they come in different colors. I contacted Sam and asked about that and his response was it was something that they have done for large orders but it does add to the price. They have looked into using other types of wood but pricing would make it prohibitive. 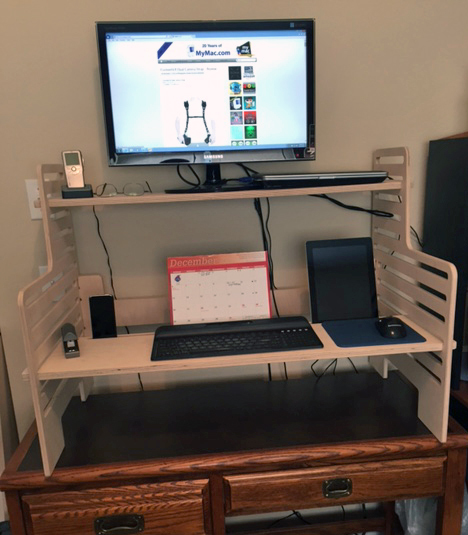 If you have been considering a standing desk, I would highly recommend that you check out the UpStanding Desk website. Besides the ability to purchase the desks from the company, they also sell the plans for $49.99 USD so you would be able to download the plans for a desk in a variety of file formats, including PDF, Adobe Illustrator, and CAD-compatible DXF files as well. You would just need to bring the files to any local fabricator with a CNC router and they would be able to make the desk. The company also offers extra shelves starting at $45.00 USD. All in all, for the money, a great buy for those who wish to stop sitting and want to stand up for something different. I give the UpStanding Desk a My Mac rating of 9 out of a possible 10.